RG Group’s first Residential Project – RG Residency – was launched in 2010. This beautifully designed residential project is spread across approx. 12.75 acres and offers more than 1900 apartments in 1/2/3 BHK configurations across two construction phases. 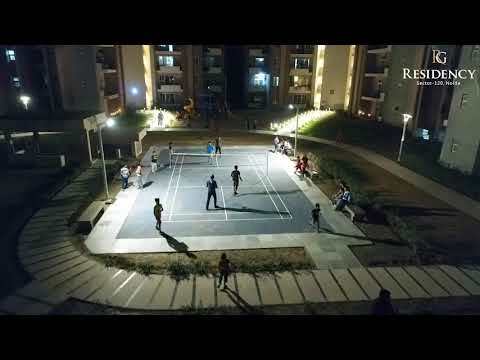 It is the first Group Housing Project in Delhi NCR with lush green landscaped garden, jogging tracks and playing areas for children at the Podium level. The Project involves no hidden cost and all amenities being offered are incorporated in the cost of the unit with no additional charges for any facility like Parking etc. The project offers a number of world-class lifestyle amenities such as a modern clubhouse, hi-tech gym, swimming pool, Lawn tennis, badminton courts as well as a jogging track. All efforts have been made to create a comfortable living space with 100% electricity backup and 24×7 water supply. Manicured landscaped garden at podium level, kids play area, an Amphitheatre, cafeteria, reliable maintenance services and approved fire-fighting measures complement a super market, salon and pharmacist for the necessary amenities. Electrical Fittings - Modular electric switches. Walls - Combination of premium ceramic wall tiles & Paint. Vanity Mirror. Walls - Combination of premium ceramic wall tiles & Paint. RG Group, the most transparent real estate developer in NCR, offers the most trusted and simplified commercial space and home buying procedures to its stakeholders and customers. The group has delivered 14 commercial and retail projects across Delhi-NCR and presently has around 10 million sq ft under various stages of construction. Content provided by RG Group. Info Edge (India) Ltd. disclaims all warranties against infringement.